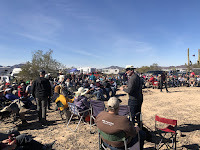 Today was the last day of Quartzfest, the amateur radio conference. 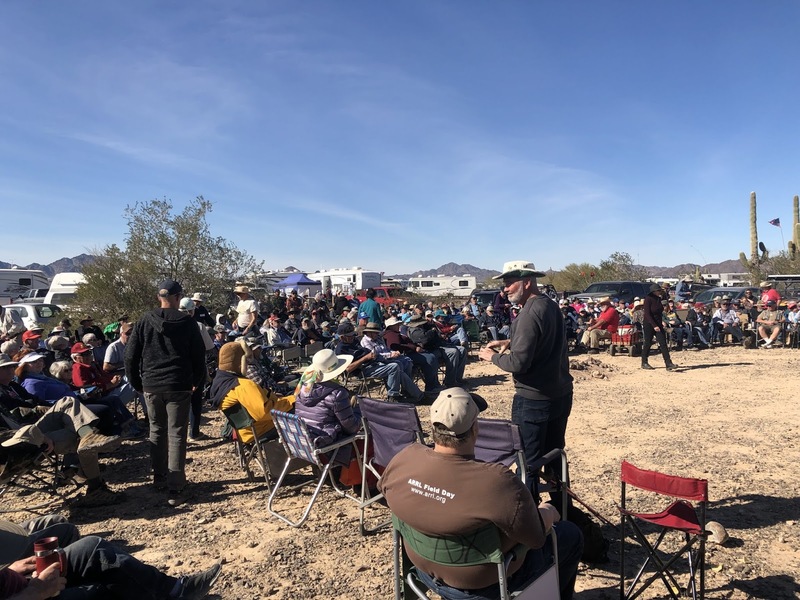 At the closing ceremony they had drawings for a lot of donated items including an Icom 9700 VHF/UHF radio that was just introduced here at Quartzfest by a representative from Icom. The picture is the crowd waiting for the drawing. Attendance was an all time high of 1043 and you had to be present to win. The organizers even had to modify their software a few days ago to allow more than 999 attendees. Right after the closing ceremony, there was a mass exodus from the campground. I think that it briefly hit 70°F this afternoon and our batteries actually hit 99% for the second day in a row. They do reach full charge but not enough to push the charge controller into absorption mode let alone float. To accomplish even this, I run the generator for a couple of hours in the morning then let the solar finish them off. I did go up and clean the dust off of the panels and I’ll say that it made a half an amp improvement just to make me feel better for cleaning them. The last time they were cleaned was at Cottonwood, AZ. I thought that there may be a lot of dust out here from the passing vehicles. 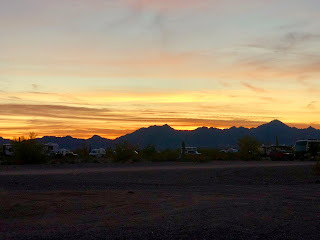 Boondocking Dry Camping - We arrived here at the Roadrunner BLM 14 day camping area last week on Saturday. We arrived with a full water tank, empty grey and black tanks and one full 30 lb propane tank and one almost full tank (used for two days). According to the questionable RV gauge, we still have 2/3 fresh water and 1/2 full grey tanks. The black tank gauge always says full but it’s only been a week so I’m sure that it’s fine. We ran the partial propane tank empty on the 8th day so I am assuming that the other tank will easily last until we are at our next RV park on Monday. I still have the 10 gal of fresh water in the back of the truck in two five gallon jugs. I won’t transfer them to the trailer unless we actually run out. I’m impressed that we haven’t needed more water. Dom pointed out that this really wasn’t boondocking as there were too many other RVs around. A more accurate description is dry camping. We have been using more propane and battery power due to the near freezing temperatures at night. To charge the batteries more efficiently, we could use more solar panels and a better converter aka battery charger. The solar system was sized so we could double the panels without changing any components. The built in converter will charge at about 15 amps initially but quickly drops down to only about 3 amps. At that rate, we would need to run the generator all day to rechage the batteries. I had tried to order a multi-stage charger such as the Progressive Dynamics converter which has a “boost” setting of up to 60 amps. This would charge the batteries to about 90% in only an hour or so of generator use. Then let the solar complete the process. But, like many other things, they wouldn’t ship this item to Alaska. I think that I may pick one up here in AZ somewhere. I thought at the RV show but no one had useful things like that. The focus seemed to be on gimmicks and junk. Or half million dollar RVs. 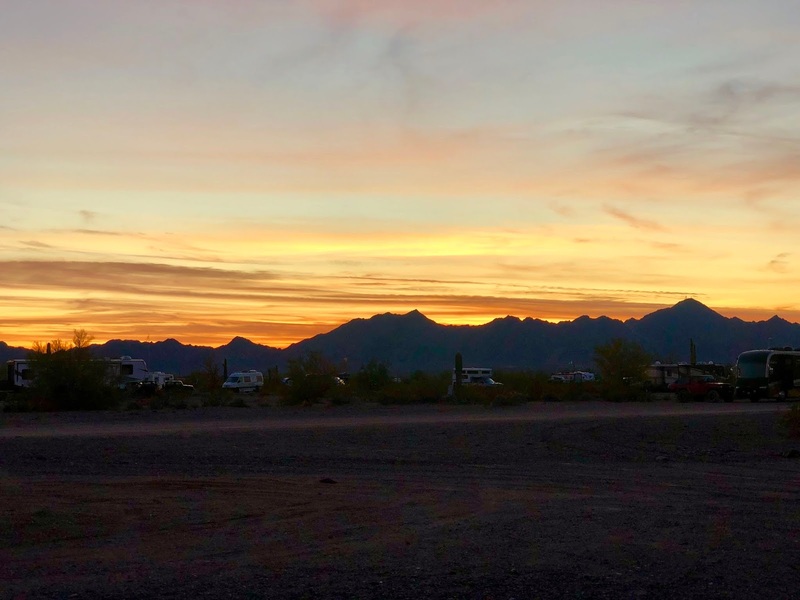 Would I go to Quartzsite again? Sure, just not anywhere around the time of the RV show. It was nice to visit again even though it was in the disaster that is Quartzsite in January. Amazon has the 70 amp version and the upcoming month long stay is a good opportunity to install it. I've used the PD60 converter in three RV's, first as replacement in the '91 motorhome to get rid of the useless converter charger it came with and added to 2003 cargo trailer. The 2010 Desert Fox trailer came with the PD60. I think I ordered from Best Converter who did ship to Alaska. But you shouldn't have any trouble getting one in the lesser 48 with an amazon locker. Lots of things learned for you (and your readers) during this event! Thanks for the reports...now we don't have to go, lol.